1.29 p.m. R1 10 Press My Buttons (4 m Raise the Flag – Ignite, by Yamanin Vital) – Jordan Grob (a2); seventh to subsequent winner Aigne (Sufficient) in the Maiden 2200 metres on 16 March at Te Aroha, she has been given time (40 days) and contests the $10,000 Maiden 2100 metres. Given a pedigree to keep improving with maturity, she has produced the odd encouraging performance and a genuine pace could aid her finishing closer. Fixed odds: $61.00 & $9.00. 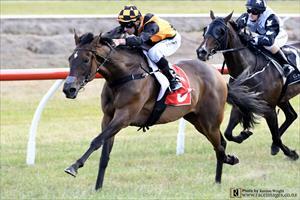 4.59 p.m. R8 8 Reliable Lad (3 g Reliable Man – Fiorenza, by Stravinsky) – Jake Bayliss; finished fourth on debut here in the Maiden 1200 metres on 7 March, third to impressive subsequent winner Hanger (O’Reilly) in the Maiden 1400 metres on 28 March at Matamata, and contests the $10,000 Maiden 1600 metres. He has the speed to negate barrier 11 and should go well again if able to secure a reasonable trip. Fixed odds: $9.50 & $3.20. 4.14 p.m. R7 8 Ruby Armani (5 m Makfi – Trujillo, by Saint Ballado) – Darryl Bradley; gained value stakes form here on Easter Saturday (31 March) when finishing strongly from beyond midfield for second in the Flying Handicap (Listed, 1400m). Drawn wide (10) in a softer field for the $50,000 ITM Anzac (Listed, 1550m), the right tempo, trip, and ride would have her in the mix again. Fixed odds: $14.00 & $4.00.